Below is the feedback from the students who attended SIGGRAPH 2005 in Los Angeles through the Spend a Week at SIGGRAPH program. The ACM SIGGRAPH Computer Graphics Pioneers sponsored the students. SIGGRAPH was an amazing experience. I was stunned by some of the new technologies that they had for display at the conference. I think I got it easier than most of the people that went to it. I met my mentor early, before the doors were opened to most of the displays. That way I got to see many of the displays before everyone else came in. The first thing I did at the conference was find my mentor. He helped me with registration at the registration desk. Then we picked up the stuff that was waiting for me. It helped to have a map because the area was huge. We went to the section where new products were being displayed and sold. That was one of my favorite places at the conference. There were a few displays that were showing a normal movie. On the side of the screen they had a different screen playing it with enhanced colors. The change made it look a lot more life-like. The light especially seemed to change. Another thing that I found really interesting was a monitor and program that tracks the movement of your eyes. It uses the information like it would a mouse. You can move a cursor or dot without even having to move your hands. The animation programs that were on display were very complex and I enjoyed watching what could be done with them. I sat and watched a graphics design program being displayed. It was incredible what they could do. Along with all they could do with the program, they showed how they were able to import and export the images to different programs and use them there. After I looked at most of the displays in that area, I went to the Emerging Technologies section. That was my favorite part of the conference. I did not know that the displayed technologies were being developed. Because of that, it was very interesting for me to see them all. The first thing I saw was a hang glider simulation. I decided to try a kayak simulation but I was not good at it and got caught on some rocks. After trying that, I went to all the other displays in the room. Many of them were simulations of some sort. One simulated the feeling you get by drinking through a straw. Another made you feel off balance and made you want to step to one side. I like the display that had vapor coming from the ceiling. An image was projected on it and it could be used as a screen. It also had some rods that could be used to move shapes around. All the technologies there, I found interesting. After I was done with that section, I got some lunch and went to the Electronics Theater. I loved the short films that were played. “9” and “In the Rough” were my favorites. From the theater I went home. Even though I was only there for a short time, I enjoyed it all. I got to see more of the technology that is coming out now. The SIGGRAPH conference was very interesting. I saw a lot of unique exhibits that blew my mind. For this being my first time at SIGGRAPH, I didn’t know what to expect. I was certainly amazed by what I saw. I first heard of the conference from my Yearbook advisor. I am the Yearbook editor at my school, and my advisor thought that attending the conference would give me a knowledgeable view of computer graphics. I’m not much of an artist, and I’ll honestly say I didn’t really have an interest in computer graphics. However, I will say that what I saw made me appreciate the field of computer graphics. It wasn’t enough to make me want to pursue a career in computer graphics, but it was enough for me to respect the field itself. There were some things that caught my eye at the conference. In the “Emerging Technologies” gallery, I really liked “Virtual Hang-Gliding Over Rio de Janeiro” and “Ton2: A VR Application With Novel Interaction Method Using Displacement Data”. Virtually hang-gliding over Rio de Janeiro really impressed me. The group of people who designed that amazing machine did a wonderful job of bringing Rio de Janeiro to the user. Ton2 is a cool interactive video game. I think it was a wonderful idea to take a traditional Japanese game and modernize it. The game was pretty simple but it was still fun. I was truly impressed. The short animated videos in the Animation Theater were also enjoyable. They brought all types of emotions out of me. Some films made me laugh and feel good inside. Other films scared me or intrigued my mind. I really like two films that I saw. “Hopeless Romantic” was a sweet film about a guy who struggled with how to tell his love who much she meant to him. I don’t remember the title of the other film that I liked, but it was hilarious. It was about these creatures who thought they were getting drunk off alcohol when in truth their drinks were non-alcoholic. It was so hilarious. Those short films were better than some films that I pay to see in theatres. Even though I honestly enjoyed myself at the conference, I do have a suggestion. I would suggest something like a scavenger hunt, where the participants go through most of the conference. They would have to do whatever stated on their checklist. At the end, the winner(s) would win an amazing prize. I’m suggesting this because I had to walk A LOT at the conference. When I came home, I had no feeling in my legs. Not only would the participant see most of the conference, but he/she will not me so bad about walking/running to win a prize. Even though this was my first time at SIGGRAPH, I really didn’t have any strong dislikes because there were a lot of things to do but it was just up to me to get to that specific place on time. On Sunday, July 31 through Wednesday, August 3, I went to the LA Convention Center to attend an event called SIGGRAPH. My science teacher introduced me to the event. I had little idea what to expect, and I only knew that it was about computer graphics (a subject I was very interested in). When I arrived on Sunday, I took my Dad with me to meet my mentor, and he seemed genuinely interested in making sure I had a good time. My mentor took us upstairs to the registration area to get my identification card. I didn’t have much time that day, so I left soon after. The next morning, I drove to SIGGRAPH and started exploring the event until I met up with my mentor again. He gave me a very thorough tour, and I ended up with a very good idea of what I wanted to do for the rest of the day. After the tour, I spent several hours in the theater rooms. What I saw changed the way I thought about computer graphics. Up until then, I had always thought of computer graphics being unable to portray real emotion. I thought the figures were always pretty rigid and expressionless. I saw one short clip about a seed that was trying to grow into a plant, but things kept happening to it that prevented its growth. My explanation may not sound very exciting, but the animation was very intense and full of emotion. I know now that computer graphics will be the new medium with which stories will be told. I believe that movies with real actors will soon become outdated. When I attended school the next day, I told a friend about the convention. He was very excited about it, and he told me how much he would have liked to go. I called my mentor, and he was able to get me a guest pass to SIGGRAPH for my friend. The next day, on Wednesday, I went back with my friend. The exhibitions were open that day, and I spent most of my time there. I made sure to visit the Radeon and Nvidia booths because they both had new graphics cards to show off. The demo videos that were created to show the graphics cards’ power were amazing. I was once again astounded by the degree of reality reproduced by computer graphics. The high point of my day was when I went to the Alienware and Star Wars Battlefront booth. There were about 20 computers set up playing Star Wars Battlefront. There was also a long line of people waiting to play. I had just gotten in the back of the line when the announcer asked a trivia question. He asked, “Who killed Jango Fett?” Several people yelled out wrong answers until I said, “Mace Windu.” I had of course gotten the question right, and I was moved the front of the line. I was stationed at the first computer where a large screen behind me broadcasted what I was doing in the game. I played my best, and I managed to get a very high score. Because I ranked so high on my team, I won a T-shirt and a free copy of Star Wars Battlefront. I left that day feeling very content. I spent few days at SIGGRAPH but I had many realizations and I learned a lot. I have a much greater respect for the field of computer graphics, and I am very hopeful for its future. I know that we are only a few years away from achieving total realism through computer graphics. When it finally becomes cheap enough for the public to use, anything will be possible, and we will live in a better world. The SIGGRAPH conference was very informative. I learned about techniques to get into the business of graphic design. It seems the mentors I talked to believe that your talent in graphic design does not guarantee you a job the people you know do. The conference had a lot of amazing things that made your creative juices flow and made your mind wander. The conference was attended by people from all over the world from Tokyo Japan to Sydney Australia many people were their. The conference to me was dominated by Asian inventors since their work stood out the most in my eyes. One invention that stood out to me was the seeliynder. I felt it might become a new form of advertisement. The device is ingenious it allows you to take a picture and see it from all angles as you walk around it. The picture they used was of a Japanese woman and it felt as if she was frozen in time. It was an experience since it felt as if you were walking around a real person. The invention was created by a guy attending Tokyo University. I felt it could revolutionize the advertising industry if the technology is developed more. A virtual simulation of gliding over Brazil made an impression on me. I felt since it really made the user feel he or she was gliding with a fan and a splash of water. The simulation was really popular and I had to wait in line to try it. I felt it might start a new trend of virtual vacations and be a great way for the not so rich to take a vacation without leaving the comfort of their own homes. The last invention that caught my eye was the interactive fog game created by a team of students from the University of Santa Barbara. The purpose of the game was to collect more x or o units to win the game. The x side of the ingenious fog screen was lit in a red light while the o side was lit in a blue light. The screen was a water vapor released screen that looked like fog. To me this game could become a very popular game and make a lot of money. To conclude this essay I would just like to say it was an experience of a lifetime and that everything was mind numbingly cool. The inventors and artists were awesome enough to showcase their work for a lucky few. The whole experience was just cool and nothing could top it in my life at least for now. Some may say that it was just interesting but I say it was inspiring to all young artists everywhere. It was an honor to be able to attend such an event and it was really cool. So I just loved every minute of it and felt it helped me map out my future. SIGGRAPH is definitely one of the most incredible and enlightening experience of my life. It allowed me to partake in an extraordinary conference and exhibit that I would be unable to ascertain through my own means, and was both enjoyable and also very edifying. Once inside of the convention center you immediately feel that there is a definite sense of excitement and interest throughout the entire convention center as people go about walking, talking and observing. I was very overwhelmed by the immense turnout of the convention and was quite pleased at the relatively direct and calm ambiance of the lobby. My eye was easily distracted though by a battle hardened X-wing type appropriately placed directly in front of the main door. Complete with its R2 unit I was immediately moved by the significance of such a seemingly obscure and innocuous movie model (aside from the keynote speaker). The X-wing I think signified a very original and incredibly fantastic extension of imagination and technology. It provided the intense possibilities of the art and expression of your mind in form and function. After this point, I was brought to my first destination of the convention. The art exhibit had to be my favorite part of the entire SIGGRAPH conference. Never before could I imagine the extent that art and technology can be applied so symbiotically and seamlessly. There is truly an eerie presence of a unimaginable beauty found in all of the art pieces, whether it was an expression of some odd function, endless fractal or boundless Fibonacci sequence the visual application was very aesthetically pleasing. I have never been so amused and excited in an art gallery which is quite a contradiction, but not in this case . This eventually led me to the next part of the convention. In the emerging technologies room I was able to find some of the most bazaar and complex exhibits I had ever seen. When I first walked in the first thing I saw was an odd visualization of the human genome and the user guided exploration of such through hand movement. I could never imagine such a thing. The exhibit was filled with very hopeful and prospective concepts that all deserved recognition, but the most incredible and distinctive exhibit in the entire emerging technologies room had to be the SEE-lynder , which was a video projection tube that allowed for a three dimensional walk around view of the subject. Pretty much a holographic projection of whatever it was you wanted to see. This boggled my mind and I was often tempted to walk by this exhibit a few times each day. I eventually found myself shredding a guitar into a music editing program in the studios on the second floor and that tied me over for the next few hours. All in all the conference was a complete success and was very beneficial to myself and all of the associated students. I think it was quite an experience and I hope I can be part of it next year. I greatly appreciate all of the effort put into the program including the mentors, mine especially and all of the people at SIGGRAPH. It was a blast. This was my first time attending the SIGGRAPH after I had received some information from my instructor. I have always been interested in computer graphics from web design to video games. The technology is always improving and becoming better and looking even more realistic than ever. On the first day of the conference I attended the Introduction to SIGGRAPH course to get an overview of what it would be like. The instructors for this class both did a great job on explaining everything, but I have to say that one really did an outstanding job despite being “under the weather”. His session on rending was interesting and allowed me insight into some of the basic tools that are used for rendering. This course was quite helpful for me, especially since this was my first time attending SIGGRAPH and I would highly recommend first timers to attend this course. When I had finished up at the introduction course I took some time to wander through the art gallery. There were plenty of kinds of art in the gallery, but the most attractive art to me was the electronic art. One of the pieces was a display of rippling effects similar to water, but when you would touch the screen it would affect the ripples on the screen. I met with my mentor on the next day and planned out what would be next to see. I attended a course that covered some of the basics of acting and movement for animated characters. This course was enjoyable and several people who attended were even used in demonstrations of the “power centers” of characters, which was quite fun with the people who volunteered. Once I was done with the animation course, I met with my mentor and entered the Emerging Technologies area. This area was the most enjoyable event I had seen while I was at SIGGRAPH. There were a variety of different inventions, tools and other gadgets to be seen and even used. The most eye catching ones to me were the “Virtual Brownies”. There was a screen with the little brownie like characters pushing a cube that was on the screen., but when the cube was moved it would move the cube that was on a display table under a camera. When the cube was put under the camera the box would appear on the screen and the characters would be drawn to it and proceed to begin pushing or pulling it. This would cause the cube that was on the table to move in the direction that the characters pushed or pulled it. Another interesting thing I saw in the Emerging Technologies area was a camera that was programmed to be locked on to a ball that was hanging from a rope. The camera would stay locked on to the ball no matter how fast it was moving or even if it was swung in a circle around the camera. If the ball was behind an object, such as a person holding the ball behind there back while in front of the camera, the camera would no longer track the ball, but the instant the ball came back into the view of the camera, it was locked back on to the ball. 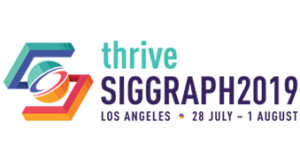 I was glad that I attended the SIGGRAPH convention and would be interested in attending in future events. I was not able to see everything SIGGRAPH had to offer, but from my first experience, I would definitely be interested in attending again. Thank You for the opportunity for letting me attend the the computer conference in Los Angeles. I appreciate your time and effort for helping me. The things I enjoyed the most were all the exhibits because they gave out free stuff. Also the Gorilla Studio was very cool. They had a computer program where you can make beats for songs. I really enjoy listening to music so when I seen this it really inspired me. I always listen to the beats in songs and feel that I could have made it sound better. I liked the program so much that I am looking into purchasing it when I receive the three hundred dollars. Another program that was interesting was one where you can draw, you can change everything from the colors to how your drawing rotates. This was cool because instead of wasting a lot of paper you can draw and save it and when your ready you can print it out. They also had a video game place. I got to see the new video games before they actually went into the stores. I also like to draw, so when I seen the place where they draw cartoons and make them into movies I thought it was very cool to see how it was really done. I would want to do that one day and found it very useful and knowledge gaining. During my visit at the convention center I got to see a very famous person in Hollywood named George Lucus. This was a once in a lifetime opportunity. He has made very good movies from Durassic Park to all the Star Wars movies . He told us how he made his movies and showed us without computers they would not have come out the same. That was something I will never forget the computer conference was full of many different stimulators. I happened to try the hand glide. It was very cool I got to pick a screen where it looked like I was flying over Los Angeles. They also had a canoe stimulator but I did not get to that one. The Art Gallery was very nice, they had many different artists with very weird paintings. Some looked really cool though and I really admired their works of art. The only thing I disliked was not being able to stay longer. I wish I could attend the conference next year in San Diego. Maybe we can keep in touch. Thank you for answering all of my questions. I learned that computers are capable of doing way more things than going online and emailing people. Computers are what shape our world today. I don’t know where we would be without them. Thanks to my mentor: you are very talented and know a lot about computers. Thank you for buying me lunch and coffee. I really appreciate your time you took to help me. It was amazing to see all the new technology from around the world. This was an experience I will never forget. The conference was very interesting to say the least; it’s amazing just how far we’ve come in computer technology. Some of the things I saw were amazing, in fact, all of the things I saw were amazing, but I did feel like some things were used improperly. What I found to be the most unbelievably amazing thing at Siggraph was the “exhale” booth. What they did was they made a skirt. What this skirt did was monitor your breathing. This skirt had a computer built into it and an attachment that you wore across your ribcage, just under yours breasts, and it would kind of “echo” your breathing pattern throughout your body. This was a very relaxing experience. It’s meant to be very therapeutic and an intriguing study on breath. Breathing is something we were never taught to do, it just comes naturally and it is often forgotten. This exhale project makes you realize just how sensual experience breathing is, and I don’t mean sexually, I mean therapeutically. In my opinion this project is useless, these people have created something amazing, a computer on your clothes, and they use it for something as useless as a breathing project. Don’t they realize that they have created a seed for the tree of a new age in computer technology? With computers in our clothes, we’d never need a desktop again. We wouldn’t have to drag around a laptop, all we’d have to do is hook up a visor to our eyes and we’re on the internet! The robe you wear around the house when you’re bored could be your computer being controlled by a simple PDA. What they have created is astonishing and I hope will some day be used beyond just breathing. Even the military could benefit greatly greatly from this project. Another thing that I found interesting was this headphone device;( the name of the project has escaped my mind). What this was was a pair of headphones that one person put on, and a controller that another person holds. If the person holding the controller wants the person wearing the headphones to, say, move left, he’ll turn the controller left and the headphones will react by activating a small electrical current to the back of the wearer’s ear, throwing off their balance, and making them turn left! It’s like a sub-level of mind control! Another interesting thing I saw was a water sumo-wrestling game! You try to push your opponents character out of the ring by pushing these three buttons in front of you that make your character move left, right, of foreword. In my opinion this wont last long in an arcade though. Even if they put a cover on it, they would have to worry about the water evaporating. To only add to the interesting things I saw, there was a movie playing on the tip of a pin, a PIN!!! This just shows us how far we’ve come in computer technology. We can now just do this to show we can do this! All in all, my experience at the Siggraph conference was amazing. There was even an abstract art exhibit! I’m not the one who’s really into that kind of art but I can still appreciate it. My experience was one I will never forget and I hope I can come again next year! I learned a lot attending it and looking at all the different things there. This was my first time ever attending SIGGRAPH. When I first arrived at SIGGRAPH I didn’t know what to expect. I’m not too familiar in the field of computers and technology, but I saw this as an opportunity to go and learn and “get my feet wet” in the field. When I first walked into SIGGRAPH we went straight to the Emerging Technologies room. That was amazing in its self. All the crazy simulations like Kayaking and Han gliding were pretty cool. I also liked the game that we got to play with the screen that was made of fog. It reminded me of an “old school” Nintendo game. Later that day I met my mentor and he was a really cool guy. He knew a lot about computers and video games and I found it very interesting what he had to say about it all. After attending Emerging Technologies, I and some friends went to the Animation Theater. That was really funny. All the little clips of stuff they were showing. It was amazing how they did some of that graphics for those short clips. Then there was the Gorilla Studios which I have to say was interesting. The first thing I saw when I walked in there was the big stand with little sensors or something on them and someone dancing and it picking up their every motion. Kind of like the thing they use to create video games such as sports games for the moves. My friend tried it and it was awesome! And another thing that caught my attention was the art show that they had set up right when you first walk in. Those designs were amazing! It wasn’t until later I learned that they were all made up by some mathematical code through computers which I thought was even better. I had a blast at SIGGRAPH and I would do it again in a heart beat if I had the funds for it. SIGGRAPH 2005 was the first place I’d ever gone to that had so much about computer graphics all in one place. It was incredible to see all the different projects that are unique in their own ways. It must have taken a lot of time and a lot of effort to get the conference ready and looking as good as it did. The Emerging Technologies section was fascinating. I had no idea that most of those devices even existed. For instance, I learned that you can use steam as a screen for projected images. The particular model that I am thinking of is one where you can play a game on it with a wand. I must say that it was a bit addicting. In the same section were a couple other projects that especially caught my attention, two of which were the hang glider simulator and the interactive robot, Quasi. I was able to go for a “ride” on the glider. At times it was a bit frustrating because the head gear you have to wear didn’t fit over my glasses very well, but overall it was an exhilarating experience. The robot, Quasi, by far made the biggest impression on me. It blew my mind how it talked with expression and feeling, how it had a sense of humor, how it could make connections about topics during the conversation, and how it related in general to people of different ages in ways appropriate to their age. I had a relatively long conversation with Quasi about where I live and where I work. It asked me about my favorite sandwich at Subway and had me laughing with disbelief. I never got a chance to ask it’s supervisors about how it functions but I would like to find out sometime about its mechanical structure. Another place I visited was the Animation Theatre. The presentation showing at that time was “Discover”. It was interesting to see the different looks of and uses for animation. They had everything from short completely animated films to clips from full length motion pictures that incorporated animation with reality. There were also advertisements and plans for architectural designs. I think it is a great way to demonstrate the wide variety of purposes and applications in computer graphics. Personally, I am more interested in the art spectrum of graphics rather than programming. It allows you to be extremely innovative, creative, and expressive. That being said, I thoroughly enjoyed the Guerilla Studios. I spent most of my time in there playing around with the Clay Works program on one of the computers. My friend and I had loads of fun experimenting with it and figuring out how it works. I liked how the pen would react when you “touched” the clay. I could feel resistance when that happened so it was much easier to control my movements. That form of digital art appeals to me and I would not dismiss the possibility of tying in out in the future. Another area I visited was the Art Gallery. Like I said before, art allows you to be very expressive. This was especially apparent in the models displayed in the Gallery. Each work of art is unique and portrays part of the artist’s personality. My favorite pieces were the ones using digital photography. I have a soft spot for photography and am greatly interested in pursuing it in college. Although I did get tired from walking around for hours on end, I admit that I was vastly impressed by the professionalism of the conference and everyone’s willingness to help out when there are any questions. I would call it a success and am grateful for the experience. It put a new look on computer graphics and technologies for me. I am also appreciative of my mentor for taking time to talk with me and help me find what fields I am more interested in. I would recommend the conference to anyone.